Surfacing was underway through Temple Circus giving an exciting glimpse of the final scheme. As construction moves into its next phase, a new diversion came into effect at 8pm on Sunday 21 October. 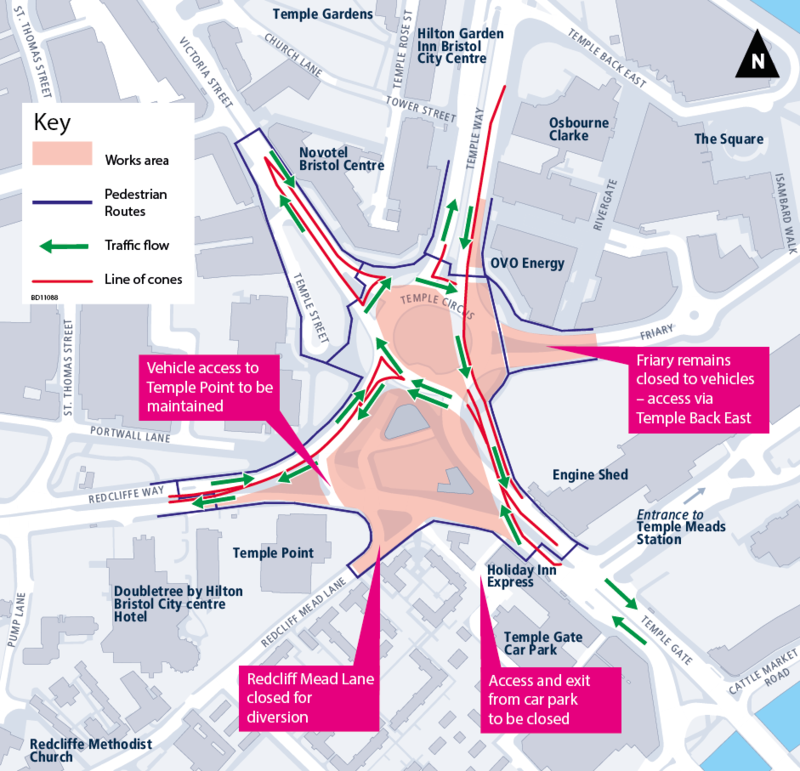 Traffic going north on Temple Gate now travels via Temple Circus if they want to turn left into Redcliffe Way, as shown in the diagram below. This change allows construction of the carriageway and footpaths as well as enabling District Heating Main works. Diversions for motorists, cyclists and pedestrians are marked around the site. This road layout is planned to be in place until February 2019. We will continue to update our Temple Gate improvement works page with the latest information on road closures and traffic disruption. Press release by Bristol TempleQuarter. Network Rail is working 24/7 to install two new lines at Filton Bank. Buses will be replacing trains between Bristol Parkway and Temple Meads, and on the Severn Beach Line, until Sunday 17 November. You can check whether your rail journey is affected at www.networkrail.co.uk or https://www.gwr.com/travel-updates with further information on the rail upgrades at www.networkrail.co.uk/bristol-upgrades. In addition to disruption for rail passengers, we expect Bristol’s wider traffic network to be busier than usual. Bristol City Council will be working hard to manage the impact over the next three weeks. This includes ensuring that there are no planned roadworks on bus rail replacement routes.